This is last week for Silks / Vote / Exp / Gold and Letters drop events. All above will end on Monday, 19 November. You will be able to change letters for rewards after 19 November until 1 December, after that date all Letters will be DELETED from game. So-Ok has been enabled for rewards until Monday morning. Letters drop will be enabled tomorrow again and will be available until 17 November when ALL events will end. You will be able to change letters for rewards after 17 November for 2 weeks (until 1 December), after that date all Letters will be deleted from game. Letters will be enabled today for drop from monsters in game. You will be able to collect them and on Sunday NPC So-Ok will be open for rewards. From Monday to Saturday letters E-X-A-Y will drop from mobs but you will not be able to change at So-Ok for rewards! On Sunday you will be able to change with So-OK but there will be no letters drop from mobs. Rewards as always consumables, scrolls and at least one new and ugly Pet (ability). New Avatar will also be available with next Patch (7-8 November). Letters event if everything will be ok, will last until 20 November, if not.. you know. Halloween event rates has started! Silks / Vote 2x, Exp / Gold 3x in Game. Server maintenance done, all events and rates ended today. You have 6 days to use your letters, next Sunday all letters will be deleted from inventory. x3 Events EXTENDED until 9 September. Rates for Silks 3x - check Silks page. Event 3 in 1 Pack with Wep/Set/Acc, 100 Reborns, Silks - check 3 in 1 Event Pack. Starter pack 2x (silks/reborns) - check Starter Pack. Extra features for Silks are with 50% discount - check Extra. Letters drop disabled, you have time until 9 September to change them at NPC, after will be deleted from game. Server 3x rates, 3 in 1 Event Pack. Also 3x silks for voting reward. Exp / Gold / Drop is 3x too. Letters event will start later this week. (If Weapon is +42 or higher, bonus will be added too until +45) will be added later. Flags will not drop anymore from mobs. Flags are tradeable until Semi-Finals 9 JULY!!! You will not be able to transfer flags from one account to another after 9 JULY. All ranking with players with most flags will be done after grand Final at 15 JULY. Will count only flags you will have in Character inventory, not storage, this is very importnant!! One player can win just in one category (per all your accounts! I will check). For more info check Flags Event page. Database clean up after World Cup events. We would like to inform you that after World cup events we will perform a Database cleanup. That means that all characters that did not login from 2015 (1 January 2015) will be removed from server. If you need to keep your Characters, please login Account in game and Enter/Exit every character you have. It is important that you ENTER every Character and use Exit or Restart option from Menu. Rates for Silks 2x (4x with Bitcoins) - check Silks page. Items for Tokens & Silks 2x - check Tokens System. Starter pack also with Silks 2x - check Starter Pack. World Cup 2018 is starting today, first event enabled is Silks Bets. You must send PM to character World2018 with your bet, in format country code and silks amount. Max bet per match (per total your accounts) is 100k, so you can send pm 4 times with 25000. If you bet more than 100k per match per total accounts, you will not get any reward or refund. Bets will be disabled 10 min before match start, but if not (because of me being afk) all bets after match start will be refunded. You can't cancel bet, once you place it it's done. If your bet win, at the end of the daily matches (all) you get back double of your bet. For example you put 5000 Silks on Russia and they win, you get back your 5000 + 5000 Silks. If they lose you lose 5000 Silks. All Events will be available until 31 May. Rates for Silks x3 (x5 with Bitcoins) - check Silks page. Items for Tokens are at 25-50% Discount - check Tokens system. 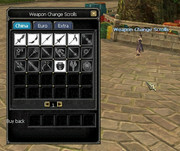 Rollback for Weapons and Shields are at 50% Discount - check Rollback system. * New weapon skins (for D14 weapons) - this one comes with no date when will be available. * There will be no rewards for PvP for now(only in events), I may think about this later. * Academy will be disabled. Instead Academy buffs will be available from Quest, Unique kills or Silks from NPC. * CTF rewards will be changed, or maybe CTF NPC items will be added. * Name change for Characters will be added, special symbols in name will be available. * Name change for Guilds will be added, special symbols in guild name will be available. * Most probably Ally Guilds system will be disabled. * Scrolls for Dragon Flags from Uniq drop and NPC for silks, GDF probably at NPC only. * Some changes to Trade system and Trans pets may be applied. *** other things I don't remember now, you can sugges on email. * About Reborns, I will increase it now to 100, next reborn cap will require 500 Players with 100 reborns, because gap between players become fast too high. I will do maintenance tomorrow 24 May, so you can still use the 5x rates for Exp/Vote/Silks and rest events options. Letters also still work with current rewards. Today 25 September ~16:00 Server time some players may have problem with connection to server. and they told me that will be resolved asap. Start your launcher to update client before login, patch was applied. Letters event has been enabled, more detailed information about this update will be posted in few hours. [Info] 3 March - Increasing Silks per charging at 1x. Prices may vary from option and country. Check FORUMS for more info. [Info] Happy new 2017 ExaySRO!! Big prize in this letters would be "Weapon upgrade scroll +20"
You can find there ALL D14, Egy A & B Weapons and Shields scrolls. So you don`t have to email me anymore to change a Weapon from D14 to Egy etc. You can do this in game now. 1) Buy scroll you need, for example you have D14 Bow and wish Egy B 2H Sword, so you buy Egy B 2H Sword scroll from NPC. 3) Use scroll, you will be teleported and item would be changed, no more actions required. This scroll will change your Weapon Stats to 100%, you will save 100% stats even if you change this Weapon to another type with Weapon change scrolls. 1) Buy scroll from NPC. You can get it from LETTERS Event or NPC with Silks, soon there will be more ways to get it. P.S. This would be event item, all unused scrolls would be deleted when XMAS events end. 1) Get scroll from letters event or buy from NPC. 3) Use scroll, you will be teleported and Weapon plus will be changed. Stats for Premium are same, the only difference is ViP effect! Golden Premium Card is WITH ViP Effect over player head. Red Premium Card is WITHOUT ViP Effect over player head. Premium + Lucky Buff + Powder (must) + rest. XMAS Tree in every house! Right now they are at Item Mall NPC in Shops area. P.S. You can apply for this bonus if you purchased 10k Egy B before, but only if item was purchased with your silks and you didn`t buy this item from players in game. Here you can read even older news from Launcher! Event Rates, Letters event started. Database cleanup, +3 bonus, Letters event. Exp, Silks, Vote, Flags, Bets events ended. Cleaned some useless drop from monsters, item list: * Return Scrolls * Tables * Stones * Exay Lottery * Awaken Cards Now monsters should mainly drop Gold, Elixirs, Weapons/Armors/Accessories, Arena coins, Shipwreck Dimension Hole etc. Hello ExaySRO, All Characters stats INT/STR was reseted. You can add them back fast on website now. Login your acc and go to Account CP to add stats. Hello ExaySRO, Today I have increased silks at charging system. All this price are for 1x (no event) Prices may vary from option and country. Check FORUMS for more info. XMAS Events 5x Rates for Silks and Exp! * Nerfed some Glavier skills % * Fort Structures HP was increased x5 times * Teleports stones was added to Hotan, DW and Jangan PVP Field (JG South) * Elixirs images on the ground now have different color * Guild emblems fixed. Black Friday at ExaySRO (ONLY 24 HOURS)!!! Hello ExaySRO, 3x Rates for Silks / Exp / Gold. Also today maintenance will add Letters event. Letters Event will start today and will last until 20 August collect letters and bring them to So~Ok in any town. More updates this week. Have fun! February 9, Weapon stats increased. X-Mas Events 2015 and the bonus that I ve promised. Halloween 2nd Part is here! Double EXP/GOLD/DROP event has been started, next events will be enabled after tomorrow maintenance on September 1, 2015.
tell me tat your account was hacked!!! February 22 LOVE, 2x Silks, 2x rates for 1 week! 2x Silks event has been started! Hello ExaySRO, Today 6 June we have enabled 2x Silks event. Also 2x Vote will be available for 1 week, this will be available first week of every month this summer. More updates in next patch! Have fun!!! Hello ExaySRO, Double EXP / Gold event has been started today 18 May. This event will last for 1 week. Have fun!!! April 19 Easter and NPC Event Started! Maintenance done, server is online. * Fixed DC in Jangan when you teleport. Now you should be able to use High graphics mode. * Uruchi pet size has been changed (now is smaller). Hello my friends and Ho! Ho! Sro!!! We wish you a Merry Christmas and a Happy New Year!!! May Roc have mercy on your soul in 2014 Christmas Event has been started! Hello ExaySRO Maintenance done, server is online. Caravans and Trans pets was enabled. Growth pet fixed (can`t summon after die). Angel`s Spirit (M/W) White fixed. Silk coins from quest can be changed for globals. Power Dress avatar price fixed. Our server is started in regular mode now. Check forum for more information. Rates Exp: 999x Gold: 75x Drop: 50x Have fun. you will be able to login.